Although a number of theories regarding the pathophysiology (cause) of DBA have been proposed, it is now widely accepted that the disorder results from a problem within the early immature red cells that makes them highly sensitive to death by apoptosis (which is a specific type of programmed cell death). It has now been shown that DBA is caused by mutations in ribosomal protein (or RP) genes. 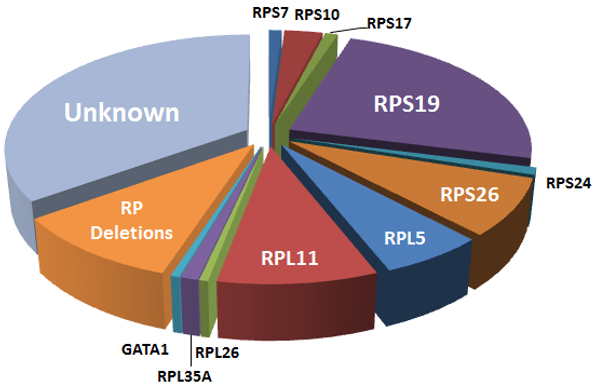 The first DBA gene identified was RPS19, one of the 80 known RP genes. The existence of mutations in genes encoding similar ribosomal proteins and other non-ribosomal protein gene mutations (such as GATA1) has been confirmed. The functions of these proteins in DBA are not yet well understood. Studies are underway to identify gene mutations in the approximately 30% of patients with DBA for whom no genetic cause has been identified. This information is taken from the Diamond Blackfan Anemia Registry with special permission from Dr A Vlachos. Please visit this website for up to date information on DBA and further topics https://www.dbar.org/diagnosis.